Visitors to the recent Singapore Street Festival on Bogalay Zay Street in down-town Yangon were treated to art, entertainment and delicious food from the island nation. Alongside 10 Singapore food hawkers you might have noticed 10 Yangon vendors chosen by Sa Ba Street Food Tours to represent and serve the many tasty snacks of Yangon. 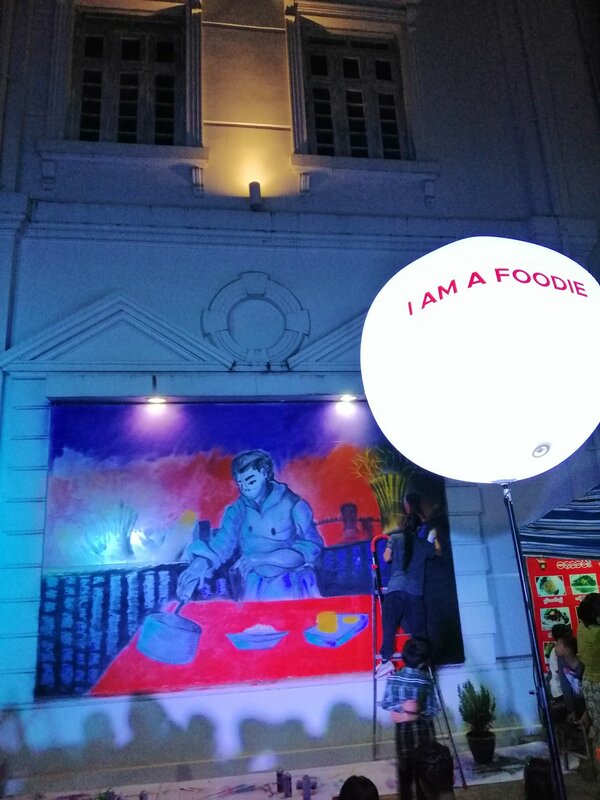 For the first time Yangon's humble street food superstars were able to flaunt their cooking skills under the spotlight alongside famous Singapore street food vendors like Hakwer Chan with his chicken rice (first street food vendor to win a prestigious Michelin Star). As part of the 500kyat Food Festival, visitors were able to snack their way along the length of Bogalay Zay street over the course of three days without breaking the bank. Ma Htay Htay Win who was serving mont lin ma yar (husband and wife snack) next to Hawker Chan said: “it's a huge honour to be chosen to cook and sell our snacks alongside a world famous chef who started out with street food just like us”. Marc Shortt from Sa Ba Street Food Tours says: “This event is a proud moment for Yangon's street food scene. Singapore street food is well known around the world and held in very high regard. We think the world should also know about Yangon's amazing offerings. Sa Ba's hand-picked food vendors from the Singapore Festival are now available for ongoing street food catering, events and private dining. You can treat your guests to Yangon's finest street food and support the hard-working independent vendors. Bring the life, lights and ambiance of downtown to your events. According to akyaw seller Ko Myo Lwin: “It is a great new opportunity for us to freshly prepare and serve our snacks at the homes of customers for their parties or events. We get a welcome break away from our usual selling locations and we have a lot of fun cooking for the customers and sharing our food!”. We have also sorts of customers passing through Yangon and joining our tours. Nilar has possibly been the smallest and sweetest. She was pretty quiet but that’s probably because she was so busy eating all the delicious street food we introduced her to. Thanks to the team at Hla Day for joining us with Nilar to see what’s good and cooking in Yangon and if you’re looking for beautiful hand-made products that support socially responsible causes you should get down to their store on Pansodan street. You can read Nilar’s full story here. Travel blogger Laugh Travel Eat passed through Yangon and joined us for an evening street food tour. Check out her article to see why she thinks Sa Ba Street Food Tours is a must-do when visiting the city. 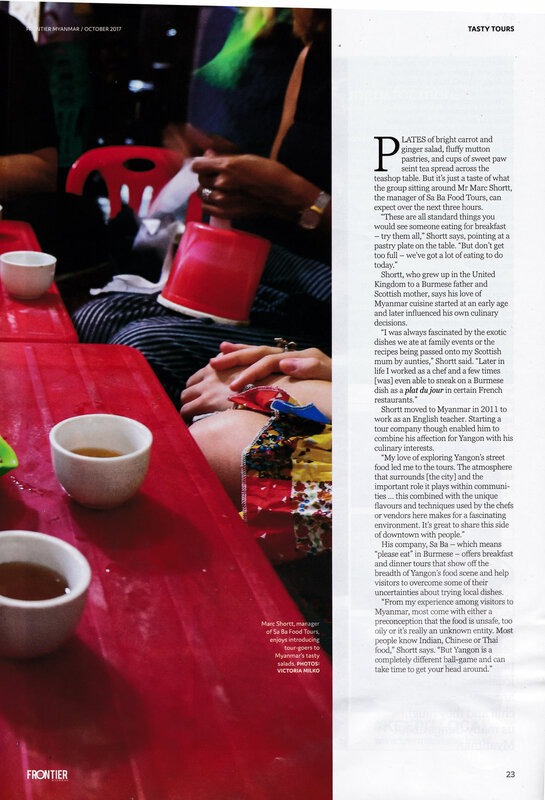 We were recently asked by travel blogger Miss Filatelista to show her what's cooking and tasty in Yangon. Walking around our favourite spots we had a great time showing her all the various and delicous vegetarian/pescetarian dishes Yangon has to offer. Check out her full article here. We were recently asked by the editor of Balance Magazine, Issy D'Arcy Clarke, to show her all the tasty dishes and fascinating neighborhoods we encounter on our evening street food walking tour. Checkout what she wrote in their latest issue! Many of our customers are as intirgued by Yangon's colonial architecture as they are by the food we share with them. Both the food and the cityscape of downtown tell the story of difficult decades past, colonialist lifestyles and the transition into modern times. Ornately designed government buildings left behind by the British, luxury department stores, flotilla company headquarters to the quaint balconies of the residences of civil servants and wealthy merchants. All of these buildings pepper downtown and add a fascinating aspect to this South East Asian former capital city. Anyone interested in exploring more of Yangon's architecture still standing from the colonial era, check out this Blog with a map and information on some downtown highlights. Some of the beautiful buildings mentioned along with many others we will also come across on our tours and often can take the time to eat while pondering the lives of these buildings. Tourism funds locals whose livelihood depends on travelers. Tourism is vital to the local economy in Myanmar, especially among the lower class. Marston has seen this first-hand, “tourism is helping alleviate poverty in Myanmar by creating new jobs in tourism, hospitality, and infrastructure-related industries because of the need to accommodate tourists.” The Oxford Business Group reports that employment from tourism in Myanmar will rise by 66% between 2015 and 2026. The potential for tourism to impact the country is immense. A journalist from Escape magazine recently came along on our evening street food tour and we showed him around the most interesting and delicious places of downtown. 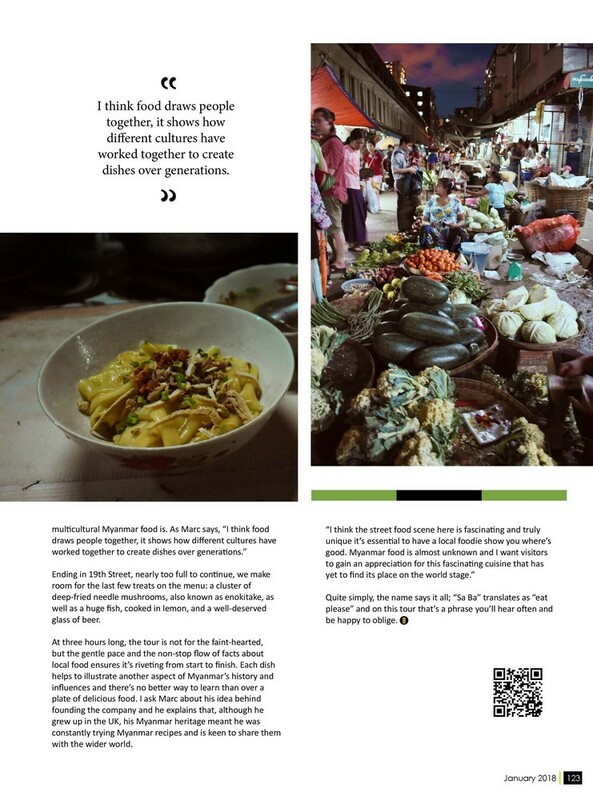 Click here to read the full article discussing the top things to do in Yangon and why Sa Ba Street Food tours is one of them. Frontier magazine based in Yangon has a great reputation for cutting-edge and quality journalism covering local issues. Recently they took a look at what's new on the tourism scene and we had the pleasure to show them around on our breakfast tour. Click Frontier Online to see it. An ode to Myanmar street snacks written by an 80yr old local. I like the sound of the singing contest between vendors held in 1942. Still today I hear some beautiful voices walking amongst the vendors. "Problems loom for street vendors: The authorities in Myanmar's big cities are pushing them away. In Yangon, around Chinatown, at the corner of Mahabandoola street, hawkers are on the YCDC’s radar. This is regrettable. Not only are they the lifeline of many families, but they feed a large part of the population. This is especially true for workers with long hours, and often with several jobs, who cannot afford to sit down in a restaurant or tea shop, but much prefer snacking on the go. Oldies like myself will miss the street vendors, their soups, their snacks, their sights and their cries." 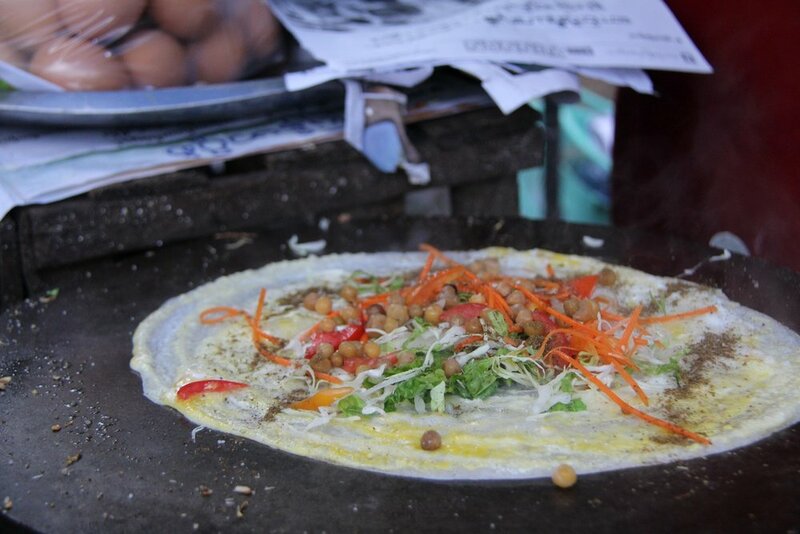 "The Best Food Tour in Yangon"
Last time we were in Yangon, the Ayinsa team had the absolute pleasure of taking a street food tour with Saba Street Food Tours. Ayinsa has been on many food tours in cities all around the world and very few come close to our experience with Sa Ba. If you're looking for an insight into the food and culture of Yangonites, then Sa Ba Street Food Tours are the way to go. We kicked off the evening tour around 5.30pm with a quick snack on some lotus seeds (pictured). None of us had ever tried them before. Their flavour is subtle and tart all at the same time with a pleasant aftertaste that lingers. A great healthy snack for any time of day. From their the tour was a whirlwind of flavours, tastes and experiences that we simply could not have managed on our own. And that's the point of paying for a tour right? To have an experience that you couldn't replicate yourself. Sa Ba delivers this in spades. They know every nook and cranny of Yangon. From the best mohinga stall in Yangon to where to find the most delectable Indian desserts in downtown. We sampled more than 15 different snacks and meals. Pro tip - make sure you arrive with an empty stomach. The most insightful part of the tour was the huge amount of knowledge that the Sa Ba guys had on every aspect of food, street life, culture and history. 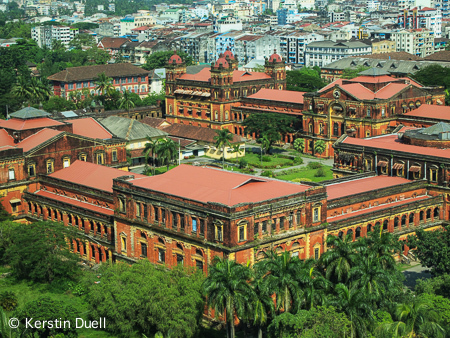 They simply opened our eyes to a Yangon that we didn't know existed. Any great tour exceeds expectations - and for us, it was the little things that took this tour from good to great. First fill a cooking pot with about 2 litres of water, add the chicken thighs, 2 whole cloves of garlic, nugget of ginger and boil. Then add the whole tomatoes to separate pot, cover with water and simmer for about 10 mins or until the skins become loose and easy to peel (this is the secret to a sweet and rich tomato sauce without relying on lots of sugar). Carefully remove tomatoes from water and set aside to cool. Once the chicken loosens from the bone, lift them from the water and put aside to cool (keep the water-we'll use this for soup). Pull the meat from the bones and dice meat roughly. Now put the bones back into the water along with the nugget of ginger, 2 cloves garlic, and continue to boil (add more water if necessary), salt and pepper to taste – here is your soup. Pull of the skins and crush tomatoes with a fork in a bowl. Heat pan, add all the oils and gently fry minced garlic, onion, and ginger with fish and soy sauce. Add the tomatoes, sugar and simmer until the tomato sauce is rich and thick (add a little water to help it stew but not too watery). Add rice noodles to boiling water until limp then divide between bowls. Spoon tomato sauce on top, followed by the chicken then garnish with spring onion greens and crushed peanuts. Strain the soup and serve as a side dish. Pickled mustard greens or kimchi and dried chilli make a perfect accompaniment. We were recently asked by streetfoodi.com to name three foods you really must try when coming to Yangon. When you know the food scene here well, it's not any easy task to choose just 3 but for first-timers to the city, here are our top choices! For the French speakers among us, take a look at this article in le Petit Journal by a journalist who recently joined our breakfast walking tour. Yesterday we had guests from Sweden, Brazil and Australia all on the same tour and it was fascinating sharing food and travel stories. Although the guests had just arrived in Yangon and never experienced Myanmar food before they were pleased to see similarities between their home cuisines here and there. It turns out people in Brazil love the infamous durian fruit just as much as the Burmese. The Swedes were impressed with the local approach to fish and the many ways it can be prepared, cooked and preserved - similar to the Swedish respect for fish. Not technically a food but the local beetlenut which many people here chew on to provide a little buzz of stimulation also isn't too dissimilar to the little parcels of Swedish snus. Although no one on the tour seems likely to take up the beetlenut habit. Thanks to Tash for sharing some photos from the night. Here's a short video we made to give you an idea of some of the tasty foods and fascinating local spots we visit on the evening tour. Thanks to Ian from California who came along on an evening tour and got these great shots. Hello and welcome to our new website. Through this blog we'll keep you posted on Yangon food news, recipes and random stuff of interest.